I never thought it would happen to me, but it’s happening. I’m becoming a wine geek. Perhaps it was naive of me not to see this coming. Wine is insidious. It creeps up on you and before you realize it, you are on a quest for the next great or unique wine or grape varietal. I think it started when I took the WSET (Wine and Spirits Education Trust) course last summer. I took it, I thought, to become more knowledgeable about the places I travel. If you read my blog, you can see that most of my travel is in either California or Italy, two of the most popular wine regions in the world. Soon, I’ll be visiting France, which is the Holy Grail for wine enthusiasts. This is serious. I took the WSET to gain a better understanding of the world’s wine regions and the grapes grown there. The WSET course was great for that – along with learning how to taste wine properly. But with knowledge comes, well, more understanding, and with more understanding comes discernment. With discernment comes… you see where I’m going with this? In the words of my teacher, MW (Master of Wine) Dilek Caner, “Life is too short to drink bad wine.” I couldn’t agree more. However, before I go to France, I’m going to Lodi, California. Never heard of Lodi (pronounced Lohd – eye)? Neither had I… until I read about the annual Wine Bloggers Conference. 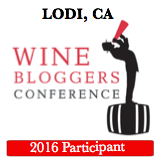 The function of the Wine Bloggers Conference is three-fold: education about blogging, writing, and social media; an introduction to the local wine area; and networking. I applied for a scholarship – and much to my surprise, I am one of only four recipients. Yay me! Another Lodi fact: Creedence Clearwater Revival made Lodi famous by writing a song and including Lodi in the lyrics, though they never played there. “Lodi is important in terms of wine grape growing. While California leads the nation with 90% of all wine production, Lodi accounted for over 17% of the grapes in the state crushed for wine in 2014. A classic Mediterranean climate pervades the region and as such, the region boasts a broad array of wine grape offerings – over 75 different varieties at commercial levels, including unique old world varietals. I’m looking forward to Lodi because it’s in California, and my goal is to visit every California wine region from north to south. I’ve been to Napa, Sonoma, Santa Barbara, Malibu, Monterey, Paso Robles, and now, Lodi. I’m getting there. My favorite photo from Napa Valley, I love photographing landscapes. If you think I’ve written a lot about wine travel and adventure up to now, just wait! If you subscribe you’ll never miss an update. You mean you’ve never listened to Creedence Clearwater Revival’s “Lodi”???? Looking forward to hearing all about the conference on Sunday. Thanks for the post on Lodi, I was not aware of it as a great wine growing area. Spectacular photos by the way!